Sam’s Sandwich was a gift from my friend Nice Kate, to my children, and quickly became a firm favourite. Nice Kate had been astonished I’d never heard of the tome, and so swiftly purchased it for my children, introducing them to some funny rhymes, cheeky characters, and the idea of putting insects in their sibling’s dinner. 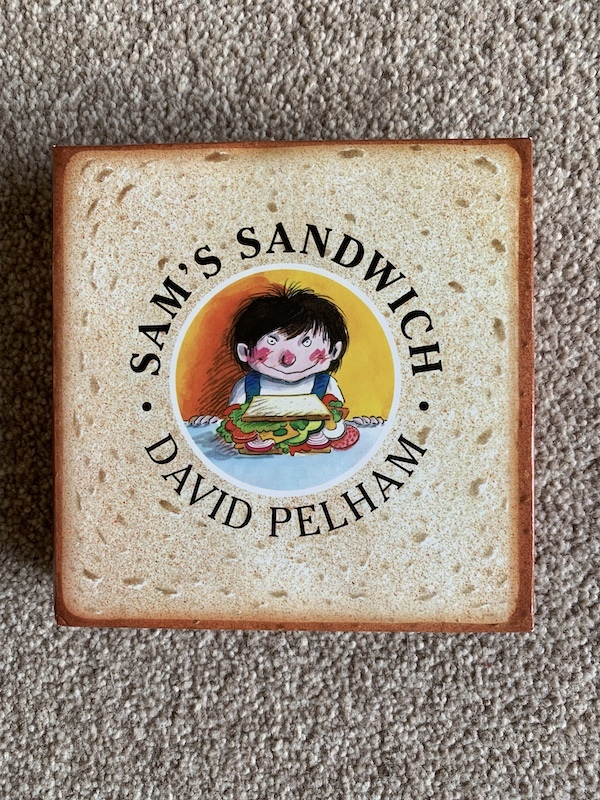 The premise of David Pelham’s Sam’s Sandwich is simple. Sam’s greedy sister Samantha is still hungry after her lunch, and wants to make a massive sandwich. Sam ostensibly helps her out, in rhyme, but on each page, sneaks a disgusting “extra” little snack into her sandwich, usually in the form of an insect. Brilliantly, you have to make the rhyme work and fold back the ingenious flaps to find out what revolting addition Sam has included. 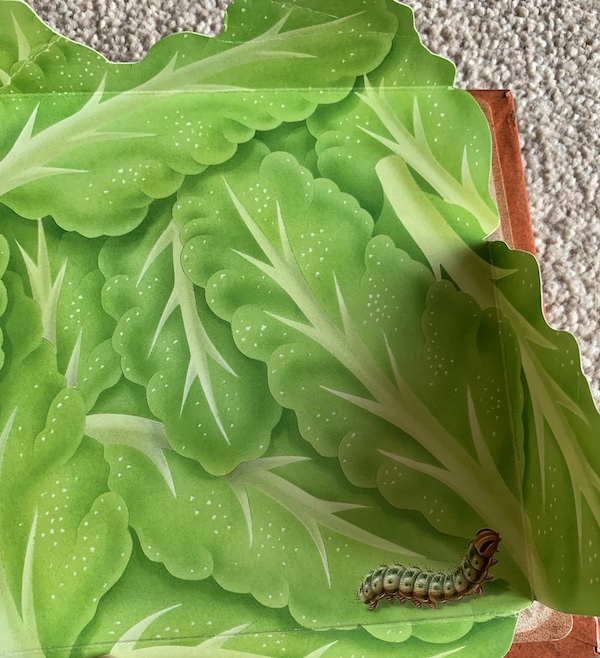 Folding the lettuce leaves back, a caterpillar appears, completing the rhyme. The book is beautiful – when all the “ingredients” pages are folded out, the book literally looks like a sandwich. It’s funny, it’s clever, it’s beautiful. I can see why Nice Kate liked it. It must have reminded her of me. 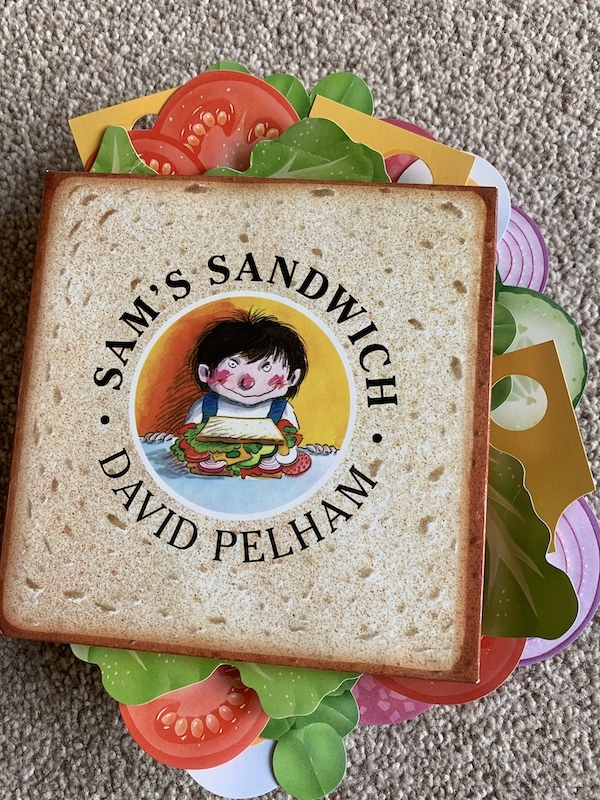 Sam and Samantha’s parents are obviously a bit crap – which should have been evident from the Sam/Samantha naming, but also allowing their children unfettered access to knives, eating between meals and insects, but who am I to pass comment? YoungestGirl has been tantrumming so much recently, I can barely remember what she looks like when she isn’t screaming, so I try not to judge other parents too much. Even the fictional ones. EldestGirl and I had a lot of fun making Sam’s Sandwich. Greedy though Samantha may be, at least she appears not to be a fussy sodding eater. 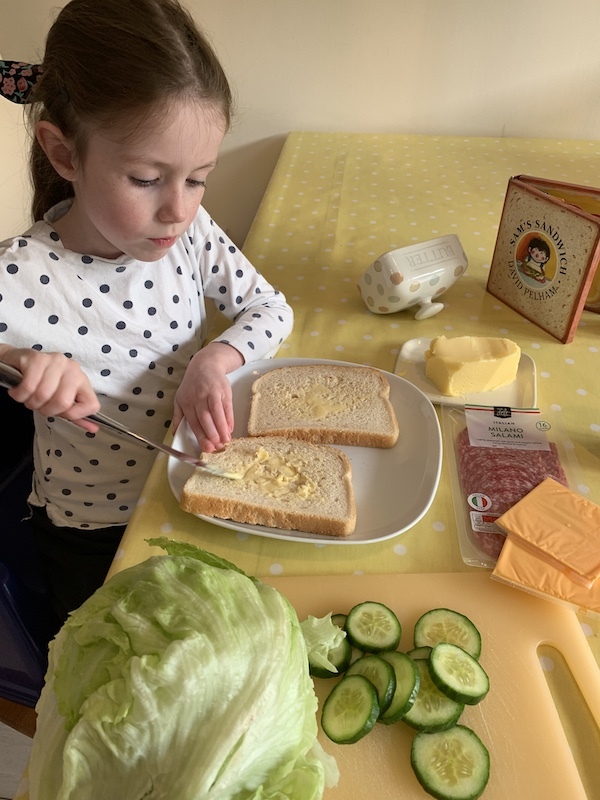 Several of the ingredients in Sam’s Sandwich were verboten as far as EldestGirl goes (to be fair, show me the child who enjoys raw onion rings). We also had to nix tomatoes and watercress, although the latter was the supermarket’s fault rather than EldestGirl’s. 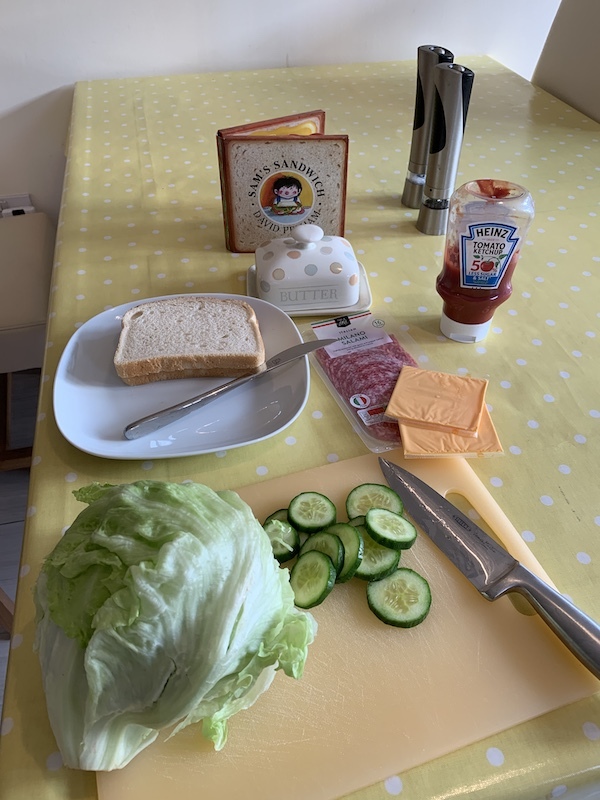 We omitted tadpoles, snails, centipedes, spiders etc., but please feel free to garnish your sandwich however your revolting children prefer it. Butter bread. Slice ingredients and layer in the sandwich. For the full Sam’s Sandwich effect, allow the ingredients to poke out the edges. EldestGirl actually ate and nearly finished her sandwich, and YoungestGirl even tried a tomato, so it wasn’t a complete loss. One sandwich. Hardly any insects. 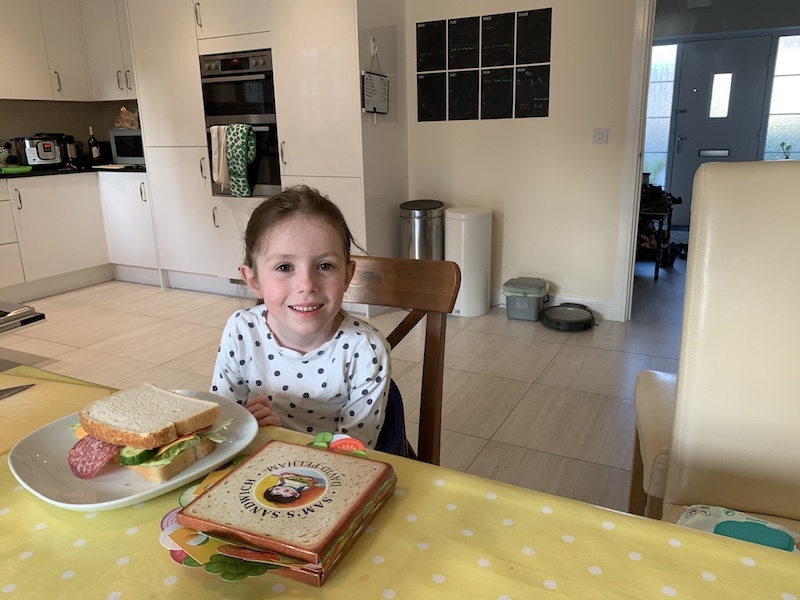 My, my, my what a fine sandwich you have created ‘eldest girl’… bet it tasted yummylicious! And.. when you need some slugs and snails ask mum to let me know.. I have lots at the lottie!